Whenever I work with mother-of-pearl I feel very fortunate. I love its smooth texture, its creamy color and delicate iridescence. Mother-of-pearl, like many substances that come from the ocean, has long been associated with wealth and abundance, peace and patience. Pearls are the adornments linked to Auset (Isis), Venus and Aphrodite, goddesses of moon and water, revered for their great feminine beauty. Pearls symbolize innocence, motherhood, patience, personal integrity, love, money, protection and luck. I have a special affinity to mother-of-pearl because I associate it with Auset, who was known in ancient Khemet as The Great Mother, queen of the gods and mother of Heru. I saw Auset myself depicted on the walls of the tombs during a trip to Egypt. With a baby at her breast, an ankh over her head and a fierce look in her eye, she reminded me that we may live in different times, but we are her daughters, still commanding respect for our bodies and our children. Mother-of-pearl also conjures up visions of Yemaya, the beautiful African goddess of the sea. Yemaya is an orisha of the Yoruba religion. Africans brought their beliefs in Yemaya/Yemoja and other deities with them when they were captured and brought to the shores of the Caribbean and Americas. Yemaya represents the ocean and everything in it. She is the essence of motherhood and protector of children. In India, pearls are worn in ensure happy wedded unions. In China, they are associated with dragons and good luck. In some regions of Europe, it was believed that pearls drew to its wearers the female characteristics of creativity and nurturing. In the South Pacific, they are worn by swimmers as protection again.st shark attacks. 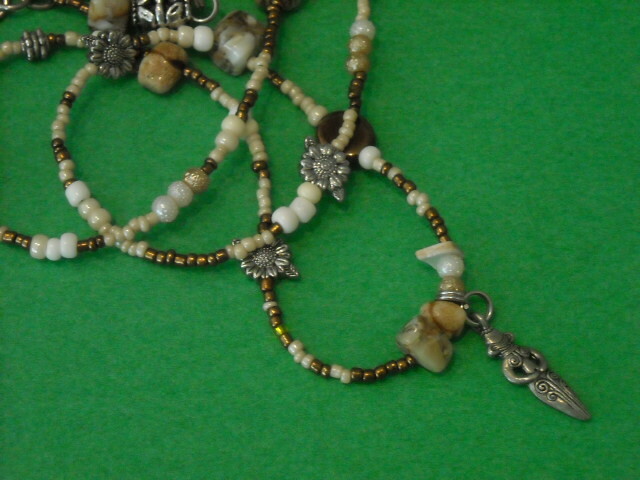 Wrap and Soul mother-of-pearl African waist beads carry the energy of the folklore of these people. Out of respect, the waistbeads are always crafted with charms that are symbols of the sea and beads to enhance the pretty ivory color. Some mother-of-pearl waist beads are also surrounded by lapis lazuli, which is the deep blue stone of Yemaya. 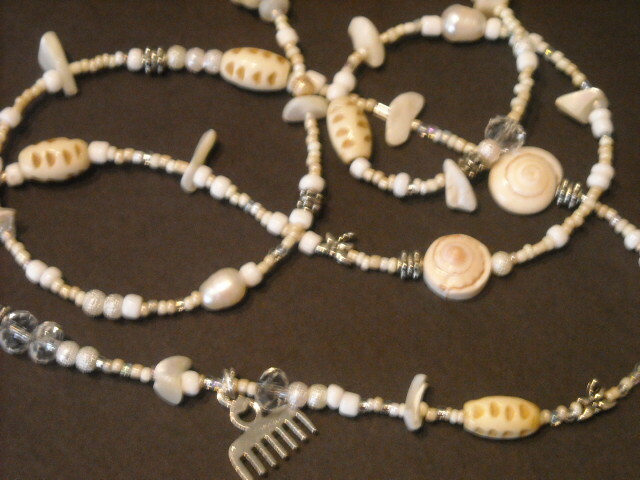 Select your own mother-of-pearl waistbeads now! Peace! I have purchased beads from you previously and I am curious to know when you will have mother of pearl waist beads for sale again soon. I am ready to get another set.